_Our oatcakes are based on a family recipe and are best described as a 'rough oatcake'. They are ideal with cheese after a meal or with pate or smoked salmon as an appetiser or canapé. To ensure freshness we only bake to order. 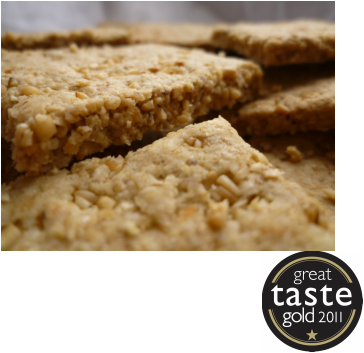 Our oatcakes are made using only the finest organic oatmeal from Golspie Mill (Finalist BBC Food and Farming Awards 2011), in Sutherland, Highlands. Their oatmeal is ground in a traditional water driven mill which makes this process close to carbon neutral.